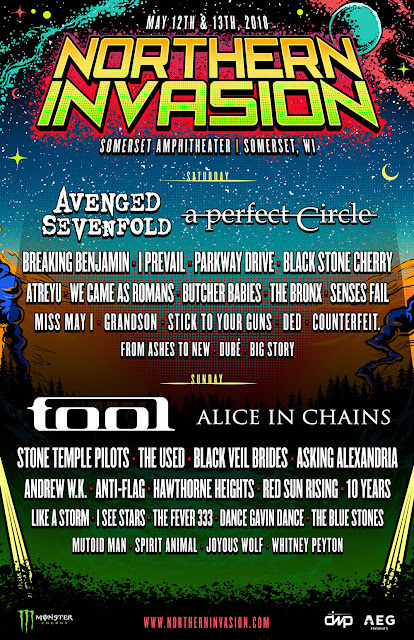 Band performance times and onsite experiences have been announced for the fourth annual Northern Invasion, Saturday, May 12 and Sunday, May 13 at Somerset Amphitheater in Somerset, WI. A limited number of General Admission weekend and single day tickets are still available while supplies last at www.NorthernInvasion.com. 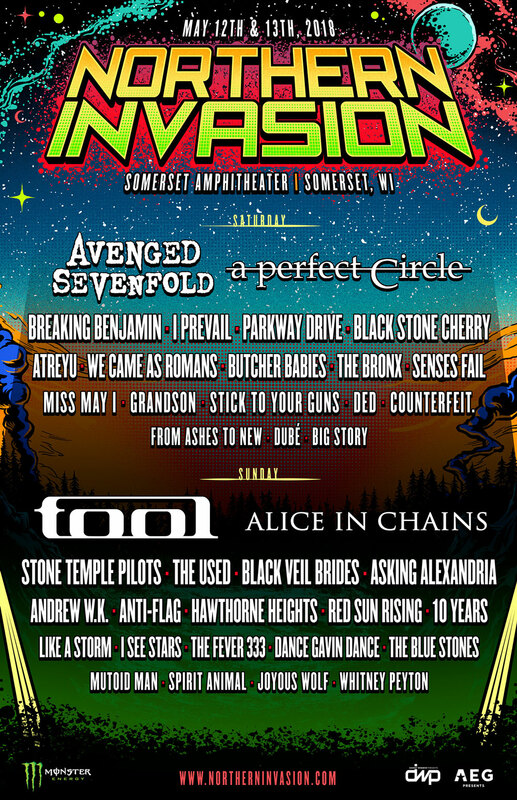 Northern Invasion 2018 will be bigger and better than ever with over 12 hours of music per day from the biggest and best rock bands on three stages—headlined by Tool and Avenged Sevenfold, along with performances from A Perfect Circle, Alice In Chains, Breaking Benjamin, Stone Temple Pilots and many more. In addition to Northern Invasion’s top tier camping experience, the Northern Invasion Good Eats area includes food offerings from top regional and national restaurants and vendors. Monster Energy: Stop by the Monster viewing deck to refuel and meet some of your favorite Northern Invasion artists! Monster Energy will be keeping all Rebels fueled up and ready to rock by offering free sampling on their Monster Energy viewing deck. Enjoy Monster Energy drinks from one of the best seats in the house. Make sure to check back throughout the festival for a schedule of Monster Energy’s interactive artist experiences. Most companies spend their money on ad agencies, TV commercials, radio spots and billboards to tell you how good their products are. At Monster Energy, we chose none of the above. Instead we support the scene, our bands, our athletes and our fans. We back athletes so they can make a career out of their passion. 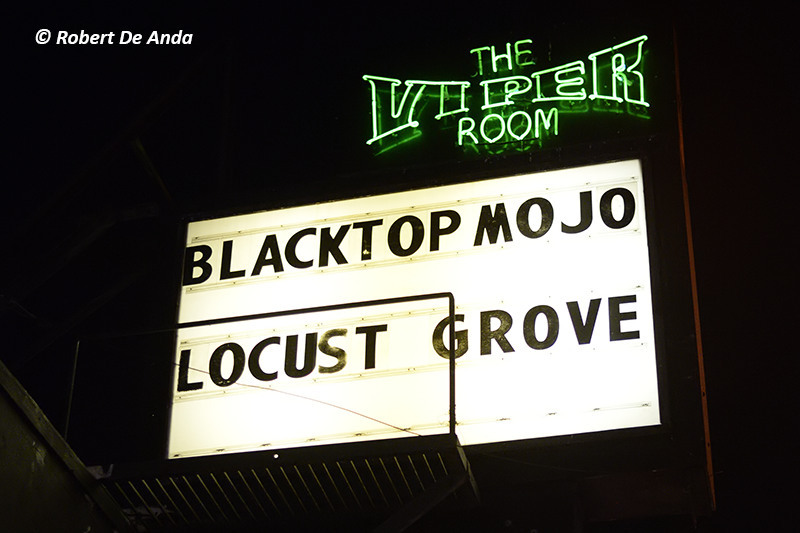 We promote concert tours, so our favorite bands can visit your hometown. We celebrate with our fans and riders by throwing parties and making the coolest events we can think of a reality. Caduceus Cellars & Merkin Vineyards Wine Garden: This wine garden will highlight Caduceus Cellars and Merkin Vineyards, owned by Arizona resident Maynard James Keenan, co-founder of international recording acts Tool, A Perfect Circle, and Puscifer. Having already dove headfirst into this venture, Maynard found out from a distant relative that wine making is in his blood. His Great Grandfather, "Spirito" Marzo, had vineyards and made wine in Venaus, Italy, just North of Turino in Piemonte. f.y.e. : Year after year, the f.y.e. Music Experience is your home for all things music! Both in-store and at the festival, f.y.e. is the only place to shop for new and exclusive vinyl. Stop by the f.y.e. tent all weekend long to find out how you can meet your favorite bands! SWFTCharge: SWFTCharge provides an ultra convenient phone-charging service for live music events. How it works: attendees purchase the charging service at one of the SWFTCharge booths and receive a “SWFTCharger” to charge their phone. Once the “SWFTCharger” is dead, it can be swapped for a new one as many times as customers want while they are at the event. By eliminating charging pads, wires and lockers we’re aiming to provide attendees with a service that is convenient, frictionless and untethered. Zippo: Zippo Encore will be back in action at Northern Invasion with a full stock of Zippo lighters, including the limited edition festival designs! Come by and spin their wheel for great prizes, enter their Zippo Custom art contest, and get your Zippo lighter filled for free. 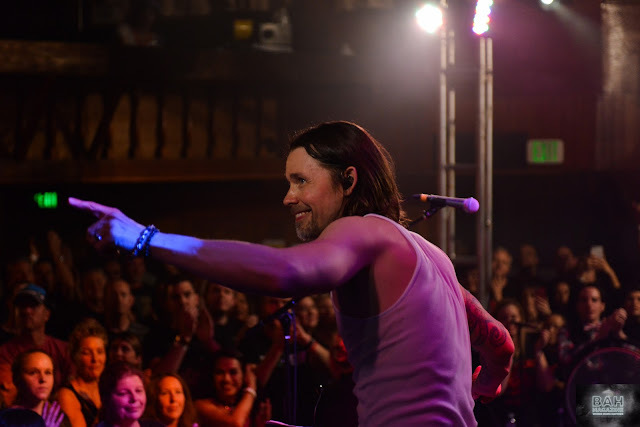 Be sure to go see them early every day, you could get access to the most exclusive performances of the festival, the Zippo Sessions, acoustic sets from some of your favorite bands! St. Croix Casinos: Once again, St. Croix Casinos is gearing up for Northern Invasion! Make sure to stop by our tent, and in the meantime, check out our concert calendar and promotions! St. Croix Casinos is known for having Roulette, Craps, Poker, Blackjack, and complementary weekend entertainment! Bud Light: As America’s most social, sessionable beer, Bud Light has always been in the business of friendship. You might say we’re even famous for it. We have been present at memorable moments among friends, big and small, for 35 years. Music and friendship go hand in hand for Bud Light – and Northern Invasion is the perfect setting for making memories with friends over a few Bud Lights. Northern Invasion weekend and single-day General Admission tickets and weekend GA ticket 4-packs, as well as tent and RV camping add-ons, are available atwww.NorthernInvasion.com while supplies last. Specially priced tickets for active military are available through partner GovX (www.govx.com). VIP packages and all-inclusive camping and hotel packages for Northern Invasion are SOLD OUT. The Northern Invasion campgrounds will be open from Friday, May 11 through Monday, May 14. Festival doors open at 11:00 AM on Saturday and Sunday. 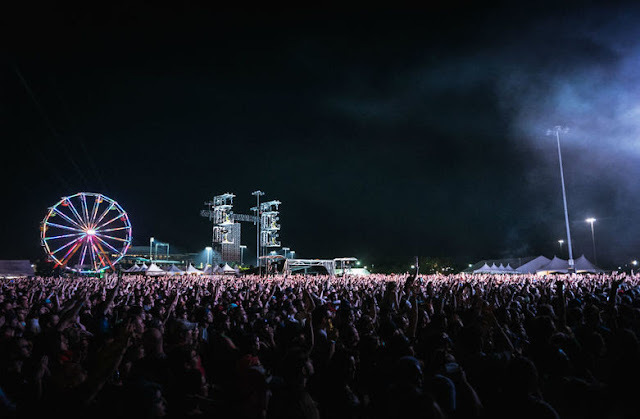 Northern Invasion is produced by AEG Presents and Danny Wimmer Presents and is part of the World's Loudest Month concert series, which features the biggest names in rock music performing in six U.S. events in distinct atmospheres during five consecutive weekends in April and May of 2018. Northern Invasion is supported by our rockin’ partners, including Monster Energy, Zippo, Bud Light, St. Croix Casinos, PlayStation, f.y.e., Fireball, Dr. McGillicuddy’s, SWFT Charge, Island Noodles, and Fxck Cancer. Somerset Amphitheater has been a favorite Midwest music venue since the late '80s. Located on the Apple River and less than 40 minutes from the Twin Cities, for years it has served as a summer hub for music and camping for those from Minnesota, Wisconsin and beyond.